Today was Day #8 of Chocolate and Flower Theme Week -- one of many theme weeks I am happy to extend by a few days to fit in more excellent chocolates in this category. 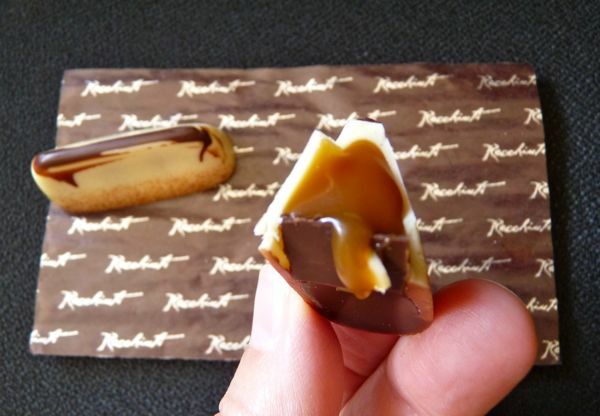 This unique-looking, elongated, triangular piece from Recchiuti Confections (based in San Francisco, CA) was a classy mix of 3 looks: white chocolate on the top, darker chocolate on the base, and rich caramel-colored -- well, soft, flowing caramel -- in the middle. There was just enough rose flavor in the caramel to make it intriguing -- intriguingly frustrating that is. 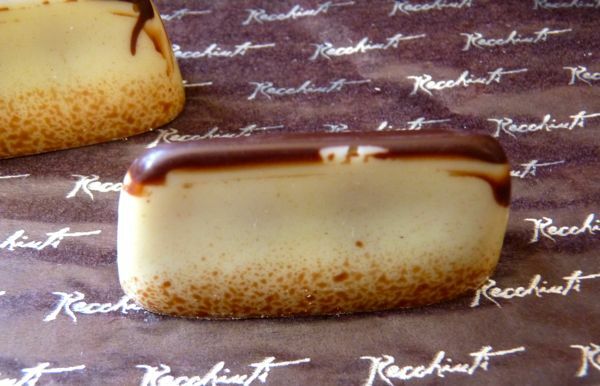 Recchiuti does make fine chocolate confections; however, their flavors are a bit more muted than I'd like sometimes. The chocolate is taking center stage and not the flavors -- in their truffles and filled chocolate case at least. Just roll me in the most fragrant rose petals available and I'd be a happy gal.